Most seamstresses keep a bin or bag of fabric scraps in their sewing rooms. With the high cost of some materials and the beauty of today's fabrics, it can be hard to throw away leftover pieces, no matter how small they are. Luckily, there are lots of fun projects you can make with all your fabric scraps. Making this bag is very simple, and it's a great way to show off lots of beautiful fabric pieces from your stash. It's also the perfect size to hold a laptop computer. You can make this project in a couple of afternoons. Cut four rectangles of cotton duck fabric, measuring 16 inches by 14 inches. Lay three of the four rectangles aside. On the fourth rectangle, begin arranging scraps of fabric to make a crazy quilt panel. To do this, start with one scrap that has five sides. Applique the scrap in the middle of the cotton duck. Add more scraps to cover the entire rectangle. Repeat this process with a second rectangle. Use decorative stitches on your sewing machine to accent the places where two different fabric scraps meet. If your machine doesn't do decorative stitching, use a simple zig-zag stich in a contrasting color of thread. Add buttons and trims to accent the crazy quilt panels. Placing the right sides together, sew around two short sides and one long side of the crazy quilt panels, leaving a half-inch seam allowance. Repeat this process with the plain duck panels. Following the package directions, attach the magnetic snap to the lining portion of the tote. Nest the two parts so that the right sides are together. Insert the cotton webbing to create handles. Pin around the raw edges at the top of the tote, and then sew the seam, leaving a half-inch seam allowance. Be sure to secure the ends of the webbing in the seam as you sew. Leave six inches of the seam open for turning. Turn the tote right side out, and iron it. Pin the open section, and top stitch the entire top of the tote. If you do a lot of sewing, you probably use your pincushion a great deal. 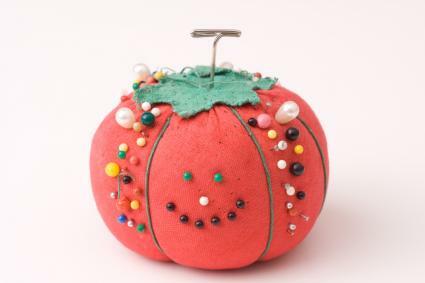 You can make an adorable classic fruit or tomato-style pincushion with a few fabric scraps. Use any bright fabric scrap to create your fruit: purple for plums, red for tomatoes, yellow for lemons, and other classic combinations. These pincushions make great little gifts for other seamstresses in your life, and you can make them by hand in less than an hour. Take large running stitches along one of the long sides of the rectangle, leaving the end of your stitching loose. Repeat with the other long side. You'll use these stitches later to gather your pincushion. Fold the rectangle in half so the short sides meet and the right sides of the fabric are together. Sew a seam up the short side, leaving a half-inch allowance. Secure the seam when you are done. Pull the loose end of thread on one of the long sides to gather the fabric. When the fabric is gathered tightly to create a little bag, securely sew the end closed with the raw edges inside. Fill the bag with stuffing, packing it tightly. Pull the remaining loose thread to gather the top closed. Hand stitch it to secure it. Cut a few leaf shapes out of the green felt. Hand sew these to the top of the pincushion to cover the raw edges of the gathered fabric. If you know a mom-to-be or a new mother, you can make this cute diaper clutch out of some fabric scraps. It's a great way to carry a couple of diapers and a package of wipes without having to lug around an entire diaper bag, and it makes a great baby shower gift. It's also very easy to make and should take you about an hour. Stack the two pieces of fabric with their right sides together. Sew around two of the long sides and one of the short sides, leaving a half-inch seam allowance. Turn the piece right side out, and iron it. Fold in the remaining raw edges, and pin to secure them. Cut a short piece of elastic, and pin it in the middle of the open edge. Top stitch this edge closed, securing the elastic in the process. Top stitch the other short side of the piece. Measure seven inches from the short side without the elastic, and fold this up against the rest of the piece. Starting at the folded edge, top stitch each side to secure it. When you're done, you'll have an envelope-style clutch. Attach a button to the clutch, so that the elastic can fasten around it. 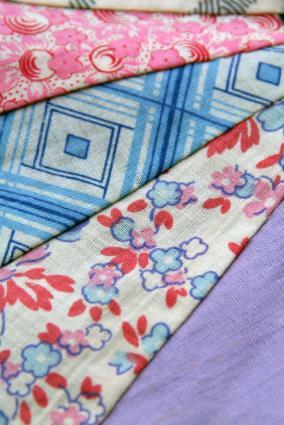 If you're like many home seamstresses, you have a huge stash of fabric scraps just waiting to be put to use. Let your imagination guide you when figuring out how to use these materials. You can make almost anything out of fabric scraps, from aprons to children's toys. Just combine your fabric in creative and interesting ways, and you'll have lots of unique scrap sewing projects you'll be proud to give as gifts or keep for yourself.